The Labour Party has suspended two more local election candidates pending an investigation. It follows a claim that anti-Semitic material was posted on social media, although the reason for the suspensions has not been confirmed. Three Labour candidates for Torbay Council in Devon have now been suspended. Virginia Keyes, Jack Critchlow and Dani Passmore have all been approached for comment. Ms Keyes, Torquay branch women's officer, who is standing in the Tormohun ward, was suspended earlier this week. It is now understood that Mr Critchlow, Torquay branch chair and candidate for Cockington with Chelston, and Dani Passmore, who is standing in Barton with Watcombe, have also been suspended, the Local Democracy Reporting Service (LDRS) has said. It is understood the three were suspended after the deadline for nominations to stand in the 2 May elections and, therefore, cannot be removed from the register. News of Ms Keyes' suspension emerged after her choice as a candidate was questioned on Twitter by Rachel Riley, from Channel 4's Countdown. The TV presenter, who has campaigned against anti-Semitism, highlighted posts by Ms Keyes sharing links to allegedly anti-Semitic material and supporting conspiracy theories. 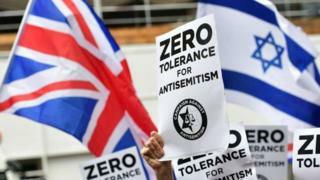 A Labour spokesperson said they could not comment on individual cases, but added: "The Labour Party takes all complaints of antisemitism extremely seriously and we are committed to challenging and campaigning against it in all its forms."